One of CISPES’ highest priorities is to recruit new activists to join the movement to end US intervention in Central America and, more importantly, give them the organizing skills that they need to help lead effective grassroots campaigns and provide opportunities to develop and deepen their political analysis. Every other year, we hold a national organizing skills training known as CISPES Summer Camp. This year, as a result of so many young and working-class people joining our July delegation, we decided hold two regional Summer Camps so that more of our recent delegates could attend a training closer to them. My name is Daniel Alejandrx Saravia Umana. I am the child of Mestiza/o “Salvadoran” refugees, Miriam Evelyn Saravia Umana and Waldo Rafael Saravia, living in the diaspora on Tongva, Chumash and Tataviam land (now commonly referred to as Southern California). I am a Mestizx musician, activist, poet, and writer resisting the colonial and imperial endeavor through art and culture. I attend California State University, Northridge with a major in Central American Studies and a minor in American Indian Studies, programs which are both currently under threat from Chancellor Timothy White. I can’t remember when I first heard of CISPES since I was born into a family of community organizers and activists and my family has been talking about the organization throughout my life. But becoming a part of CISPES happened abruptly and unexpectedly. My brother Roberto Rafael Saravia Umana and I were at a meeting with other organizations working in the Salvadoran community when I met Mattie Conway, CISPES’ Regional Organizer, and Henry Prudencio, a member of the Los Angeles chapter. At this first hello, Mattie invited me to join CISPES at Summer Camp and I decided to attend. Going to Summer Camp was an amazing experience. At first, I was wracked by nerves since I’m super shy, especially in a setting where I would be meeting everyone for the first time and spending three days with them up in the mountains. But everyone in CISPES is super chill so they helped me feel comfortable enough to be myself. Being at Summer Camp with CISPES was an opportunity for me to learn more about different ways of organizing and sustainable activism, as well as about the elections in El Salvador and the current water crisis in Tacuba, while also having fun and building community. Meet some of the sustainers who power our work! 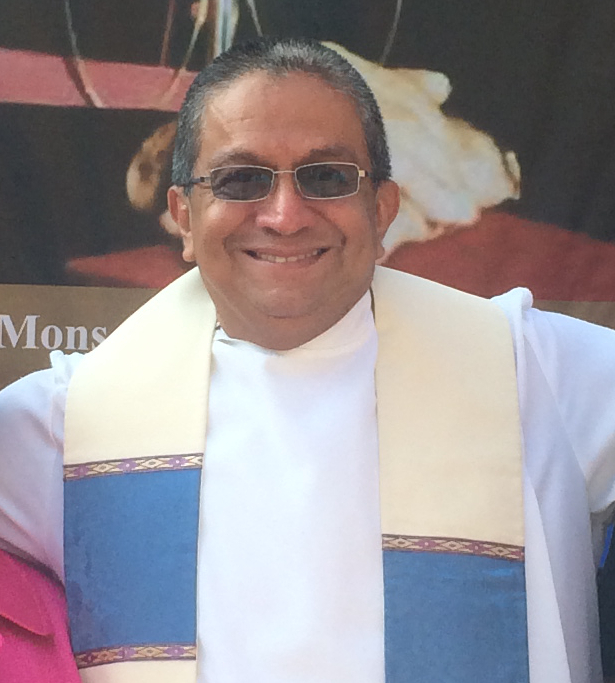 Join Padre Carlos by becoming a sustaining donor to CISPES today! Photo taken by CISPES of front page news coverage of El Salvador's president elect's comments at the Heritage Foundation as reported in the Washington Hispanic and displayed for distribution curbside in Washington, D.C.